Paris or “the city of light” is often the first real “foreign” city that native English speakers visit. It has those iconic monuments such as the Eiffel Tower, Notre Dame Cathedral the Arc de Triomphe as well as a street scene that we all recognize from movies. Paris is a big, busy city with an efficient metro system to get you around. Finding budget hotels in Paris is not a problem. 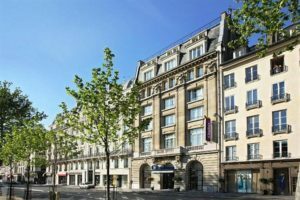 This city has a range of accommodation from 5 star luxury hotels on the Champs Elysee to simpler budget hotels in the Latin Quarter and around La Gare du Nord, the terminus for international trains from UK, Belgium and Germany. Paris districts are known as “arrondissements” and are numbered from 1 to 20. They form a spiral from the very centre to the outer districts. When choosing a hotel in Paris find out the arrondissement where it is located. Paris has many great sights and museums to visit. Once you know your travel dates it can be useful to book some entry tickets in advance. 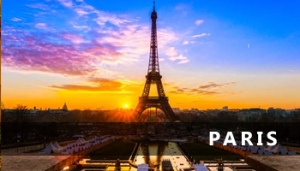 Popular destinations such as the Eiffel Tower, the Louvre Museum and the Musée d’Orsay art museum sell advance tickets online, helping you avoid long queues on the day you visit. If you are able, plan to use the metro to get around quickly an inexpensively. Most tourist destinations are within a block or so of the nearest metro station. Paris has a range of accommodation from budget hotels, homestays and hostels to five star luxury hotels. Almost all will have discounts and deals at some point in the year to fill their rooms. Try the price comparison search box below to ensure you see all the options available. You may find a deal in a higher category of hotel. The Eiffel Tower may be the iconic emblem of the city but it isn’t a great area for hotels. Better to gaze at it from other parts of the city. The famous Left Bank or Latin Quarter has a selection of popular budget hotels in Paris – restaurants too -and is located just across the bridge from Notre Dame Cathedral. For a feel of “old time Paris” try the hotels on the hill of Montmarte up near the white Sacre Coeur church. A popular area for mid-range and chain hotels are the adjacent districts of Bastille and Republique. Hotels around the Gare du Nord are convenient for the station and tend to be competitively priced.